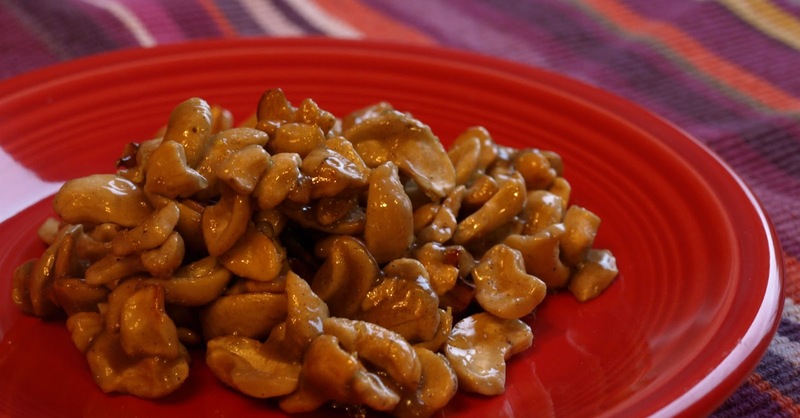 Dry toast the cashews in an iron skillet or other heavy-bottomed pan on medium heat until they are slightyl browned and crunchy. Add the butter, allow it to melt, then add the other ingredients. Stir them to combine and cook until the liquid has bubbled for about 5 minutes. Pour the mixture onto a cookie sheet lined with greased parchment paper and allow to cool. Store in an airtight container preferably in the refrigerator. I wonder how this would work with almonds? I'll test it out and let you know. Thanks for another yummy holiday treat. Out of almonds, out of lemon, but had just enough walnuts for the recipe. Delicious! I would never think of using cardamom, but combined with honey, it's delicious! Will gave it 2 thumbs up. Thanks again. 2T ghee and 2T coconut oil (because I was running out of ghee!). 1t cinn, 1/2 t clove, 1/2 nutmeg. I sprinkled sea salt and coconut over it as it was cooling on the pan.